← Restaurant Review: Taverna Agora, Raleigh, N.C. 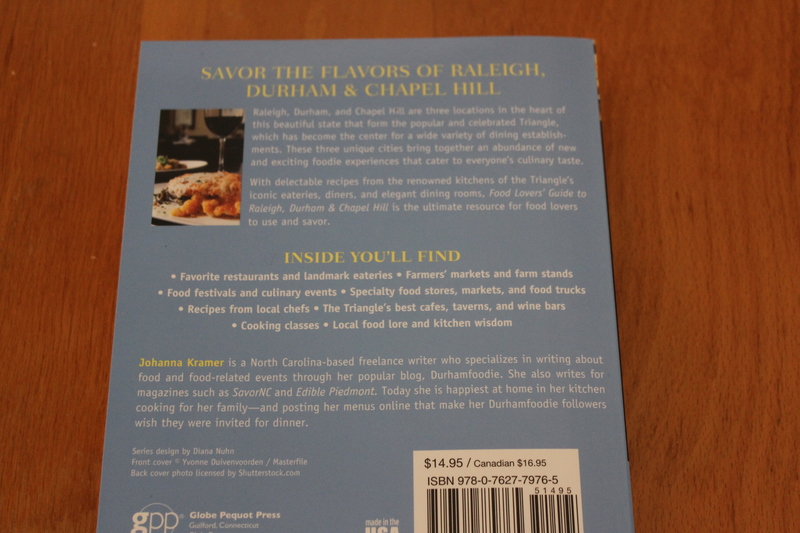 I started following Johanna on Twitter a couple of weeks ago and decided to check out her blog, Durham Foodie (http://johannakramer.com/), where I first learned about this book. I immediately went and ordered it from Amazon, where I wound up paying $14.90, including shipping. Definitely worth it! There is a section starting on p.10 on “How to Use This Book” that I recommend reading, after you check out the introduction. 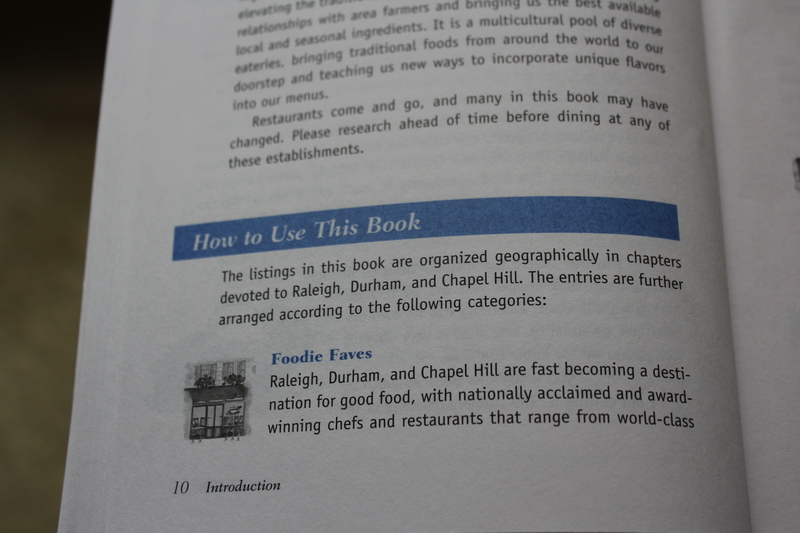 Here you will learn that “Foodie Faves” in Raleigh, Durham and Chapel Hill do not include every “wonderful” restaurant in the area, but a representation of eateries at all price points that should “please even the most discerning palates.” Johanna also notes that the restaurant summaries are not reviews, but rather descriptions of the food and the atmosphere of a particular restaurant to help you decide if it fits your needs. For each of the three cities in the title of this guide, Johanna includes landmarks, barbecue places (yaaay!) brewpubs and microbreweries (double yaaay!) and specialty stores, markets and producers. There is also a collection of recipes from some of the area’s best known chefs, such as Macaroni au Gratin by Ashley Christensen, Adam Rose’s Butternut Squash Ravioli and Pork Dumplings from Chirba Chirba Dumpling Truck. I can’t wait to try all of these! 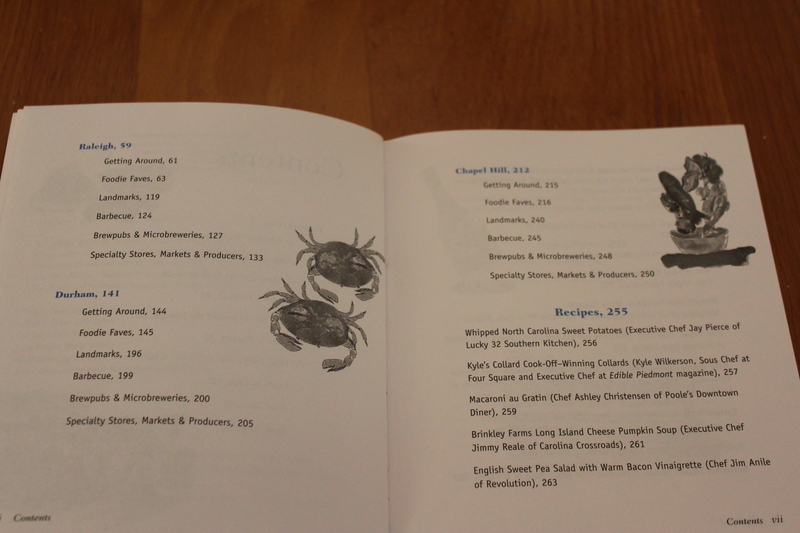 The Food Lover’s Guide closes with two appendices — one lists eateries by cuisine and the other covers specialties and purveyors. There is also a handy index at the end. I’ve included (or soon will) many of these restaurants in my blog and hope Johanna will get the chance to visit and experience all of them – she will not be disappointed! Speaking of Relish Café and Bar (which will be showing up in a few of my upcoming blogs – stay tuned) – Johanna will be there on Friday, 11/16/12, from 6-8 to autograph this book. If any of my area foodie friends want to join me for this signing, please get in touch! 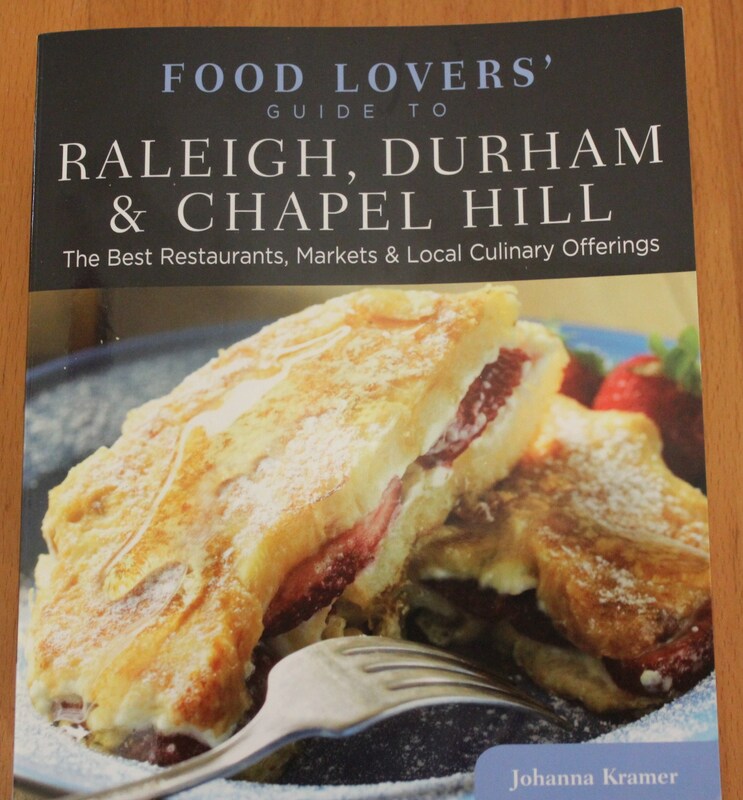 I will be keeping this great guide in my car, especially when I venture into Chapel Hill or Durham, which I used to know much better when I worked at Duke, 10 years ago. If you like to eat out as much as I do, you definitely should get a copy of this wonderful book. This entry was posted in My Favs, Tools of the Trade and tagged Book Review Food Lovers' Guide to Raleigh Durham & Chapel Hill, eat drink and be merry, Food guide Raleigh Durham Chapel Hill NC, Food Lovers' Guide to Raleigh Durham & Chapel Hill, Johanna Kramer Durham Foodie, Johanna Kramer Food Lovers' Guide, Kel's Cafe book review, kel's cafe of all things food. Bookmark the permalink.